Sly, funny, intelligent, and artfully structured, The Fortunes recasts American history through the lives of Chinese Americans and reimagines the multigenerational novel through the fractures of immigrant family experience. Inhabiting four lives—a railroad baron’s valet who unwittingly ignites an explosion in Chinese labor; Hollywood’s first Chinese movie star; a hate-crime victim whose death mobilizes the Asian American community; and a biracial writer visiting China for an adoption—this novel captures and capsizes over a century of our history, showing that even as family bonds are denied and broken, a community can survive—as much through love as blood. One of NPR's "Best Books of 2016"
One of BookRiot's "100 Must-Read Books of U.S. Historical Fiction"
"Davies, a master storyteller, blends fact with fiction in this saga of immigration, acclimation, and Chinese culture, which he tells through the experiences of Chinese-Americans at different points in history. 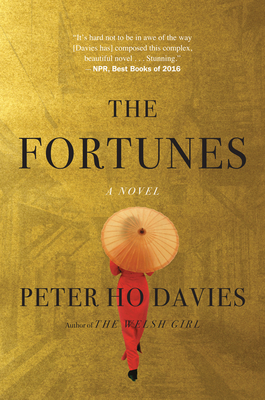 "—Entertainment Weekly, "12 must-read novels out this fall"
"I was very thankful for Peter Ho Davies’ panoramic novel The Fortunes, a moving, often funny, and deeply provocative novel about the lives of four very different Chinese Americans as they encounter the myriad opportunities and clear limits of American life. An essential tale gorgeously told. "—Chang-rae Lee, Buzzfeed, "22 Famous Writers Told Us About The Book They're Most Thankful For"
"The Fortunes masterfully captures a century of history and the survival of an immigrant community caught between two cultures. "—Buzzfeed, "21 Incredible New Books You Need To Read This Fall"
"Davies distills 150 years of Chinese-American history in his timely and eloquent new novel. In Gold, the first of its four sections, Ah Ling, 14, the son of a Hong Kong prostitute, seeks his fortune in California. He works as valet to Charles Crocker, who hires thousands of Chinese to expand his transcontinental railroad. Silver portrays the 30-year career of the LA-born actress Anna May Wong, who co-stars with Douglas Fairbanks at 19. Davies also writes of Vincent Chin, beaten to death in Detroit in 1982 by two auto workers who mistake him for Japanese, and of a half-Chinese writer visiting China to adopt a baby daughter, thinking of how to prepare her to answer the question he’s heard all his life: where are you from? "—BBC.com, "Ten Books You Should Read This September"
"The Fortunes crafts four tales that speak of the broader history of Chinese immigrants in the United States, from the hardworking valet who serves a white railroad mogul to Anna May Wong, the first Chinese-American movie star. Through these elegant, deeply embodied stories, Davies portrays the uneasy relationship between these people and their new country. "—Elle, "The 11 Best Books for September 2016"
"Absorbing. "—New York Daily News, "7 books to read in September"